Timothy James "Tim" Curry (19 April 1946 in Grappenhall, Cheshire, England ), is an English actor, voice actor, singer and composer. He is well known for his roles in The Rocky Horror Picture Show, Clue, It, Home Alone 2: Lost in New York and The Three Musketeers. He has released three albums. Curry resides in Toluca Lake, Los Angeles, California. In July 2012, Curry suffered a major stroke. As a result of the stroke, he now uses a wheelchair. ↑ Chris Thompson, 'Shake It Up!' and 'Bosom Buddies' scribe, dead at 63 - UPI.com Retrieved 2016-12-28. ↑ Abramovitch, Seth (24 May 2013). 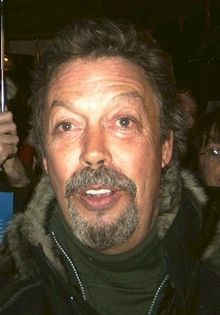 "Tim Curry Recovering From Stroke". The Hollywood Reporter. http://www.hollywoodreporter.com/news/tim-curry-recovering-stroke-558335. Retrieved 8 October 2015. ↑ ABC News. "Tim Curry Relies on His Humor While Recovering From Stroke". ABC News. Wikimedia Commons has media related to Tim Curry.